Glen Coe Skyline was going to be a big race for me. This year my sporting career has been split in two, on one side I have obstacle course racing and on the other Skyracing. On the Skyracing front I have focused entirely on the Extreme World Series. There are three races in the series but only your best two results count towards the overall standings. The first race was in Tromsø, where I managed to come second to fellow brit Tom Owens. I then attended Kima, the second race in the series. I raced here more for the experience as I knew I was most likely to perform better at the final race in Scotland. So managing 7th place I wasn’t too phased as Glen Coe was still to come and being the last race, would carry a bonus, so I still had the opportunity to win overall. After the previous two races this outcome seemed unrealistic and I toned my expectations down to merely placing in the top 5 of the series. Only the perfect day would give me any glimpse of a chance at winning. How likely could it be to have a perfect day on the day where it mattered most? Perhaps in the future I should nurture more faith. Having been back in Bergen after a long summer traveling, my training had increased in quality and quantity. The week before the race I backed off but my legs still felt heavy from the load. I was eating a lot and sleeping well but couldn’t guess as to how I would perform on the day. Arriving in Scotland I entertained myself by speaking to friends and watching the two prequel races. 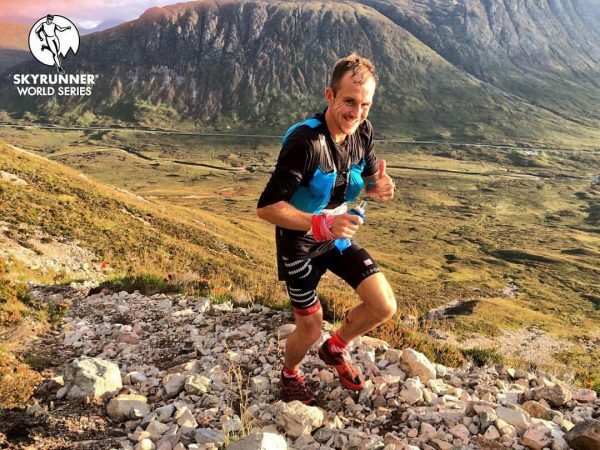 Cheering people on and seeing the joy merely participating brought to people changed something in me and I felt I no longer cared how I performed, I was simply over the moon to have the opportunity to race in such amazing terrain. This feeling stuck with me and resulted in an immense relaxation, I again ate well and slept like a baby. My kit was ready and it was going to be a fun day in the mountains, that was the limit of my thoughts as I stood on the start line. Even when my number got called out because my GPS tracker wasn’t working only broadened my smile. Having delayed the start by a minute and with a new tracker strapped on we were off. 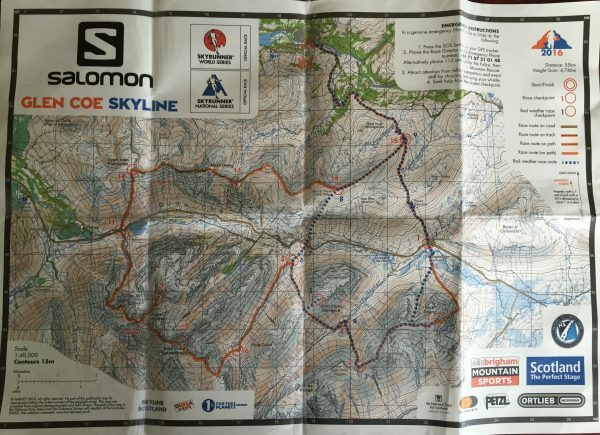 The course is a little more complicated to explain than ‘we went to the top of a big mountain and down again’ but it would contain every form of propelling yourself on two feet through the mountains possible: running, hiking and scrambling, all over steep climbs, deep valleys and technical ridges. The two sections that were fuelling the majority of pre-race chatter was the first major climb, Curved Ridge, which included sections of very technical scrambling (that some described as easy climbing) and the Aonach Eagach ridge, that would be the final exposed technical section before descending back to the event centre after 50km and 4700m of ascent. Before the first technical climb we would have a warmup of 10km with 500m of ascent. This served as a great test to see how everyone looked and I was pleased that the effort felt easy for me, in fact I felt we were going slow. This aided my good mood and positive thoughts swamped my mind. 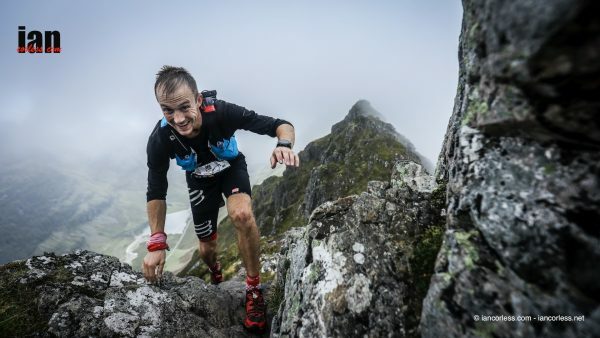 It’s important to feel happy when you are racing and I felt ecstatic – beautiful mountains, energetic legs and good company. Coming down to a road there was a mini make-shift aid station. There was only one official aid station which we were due to reach after 5 hours, stopping momentarily I realised these goodies weren’t for me but for better supported athletes, so I jumped into a big river to fill my bottles and grabbed a CLIF shot gel from my bag. The plan was to fill one bottle for the shorter sections of mountain and two for the longer more sustained ridges, it was pretty hot though so I filled up both my flasks, better safe than sorry. Starting the ascent, I was excited to see if it was as bad as people had made out. It certainly did have some very technical sections but what bothered me more was Tom and Finlay Wild (3rd in Tromsø) had pulled away from the mini group I was in. Not to worry, it was a long race. Reaching the top my worries increased as I found I was descending slower than the others too. This was to be expected though, as I was trying to run with Marc Lauenstein who had previously won Zegama-Aizkorri and Matterhorn Ultraks. Reaching a valley floor and another makeshift aid station (not for me) changed the standings and I found myself slowly gaining on Tom from second place. This section of slightly uphill running suited me and just before the steeper section started we came together. Reaching a rockier part, I could see he was in a bit of pain, we chatted about his foot which was sore on the rocks and joked a little to lighten the mood. The jokes soon stopped as we entered the cloud and suddenly found ourselves off course in a boulder field with no flags in sight! Following the route on my watch we soon found some flags and followed on. Something didn’t feel right through and we were now heading downhill! After a few hundred meters I stopped and asked Tom what he thought, he said ‘we will go back’, so turning around we headed back up hill. After a few minutes we found two people huddled on the top, this was the checkpoint we had missed and would have resulted in our disqualification! Having safely checked in, we once again started downhill having only lost a few minutes. Some more shenanigans followed with us arriving at a checkpoint ‘too early’ – we were so far ahead of the expected time the checkpoints weren’t ready for us. Helping out we delivered a checkpoint control to an out and back leg of the course and once again continued on our way. 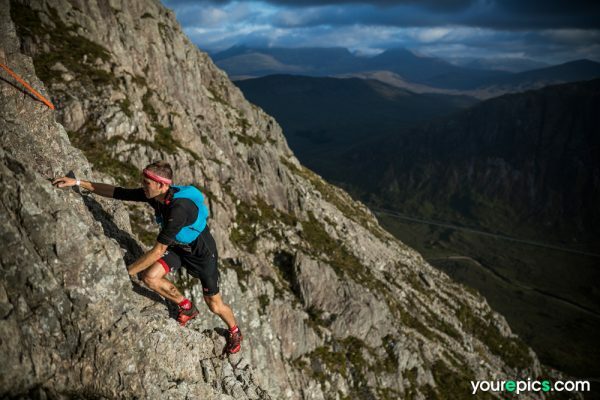 We now had a big descent before the final major ascent onto the infamous Aonach Eagach ridge. Heading down into the valley the noise of cheering and the helicopter injected adrenaline into every sinew of my body, this can be dangerous and with hours left of racing this wasn’t the time to lose control. I still felt great but knew if I made a move it couldn’t be forced, it had to happen naturally, without trying too hard. That’s exactly what did happen and halfway up the 900m climb I took to the lead and a gap started to form. Checking back Tom looked in a worse way than me but Mark still looked strong. He didn’t have another ranking race under his belt though, so as long as I beat Tom I would win the series. Continuing to climb hard but under control I was making my way to the top. Now crawling on soft heather because the gradient was so steep my calves started to cry out, just a little further though. Reaching the top I was alone and now faced the daunting prospect of facing the ridge without company. Concentrating on hand holds and foot holds I tried to find the balance between speed and safety on what is the most technical ridge I have ever been on. Hearing the helicopter hovering to film me drove me on and I started to make progress. Finally, with the most technical section done I was still in the lead but by how much I had no idea. A long grassy ridge now faced me with two minor climbs before a long descent to the finish. A minor climb after 6 hours of hard racing can feel like a mountain and my legs had finally started to betray me. Just a little further I urged them and thought ‘I could do with one more energy gel’ – tapping my pocket I felt one more in there. This summed up how the race had been for me so far: everything had worked out, everything was perfect, but I still hadn’t won. At long last I hit the main path and started to meet people. In a desperate attempt to find out how much lead I had I started to ask people to scream if someone was within two minutes of me in a hope I would hear. I didn’t hear anything. 5km to go, still in the lead. Still not knowing if anyone was steamrolling down to catch me, the kilometres ticked down. I was now within a kilometre of the finish and started to believe that maybe I had done it, maybe I had won another Skyrace and to top it off, won the one that mattered most in the series. I crossed the line in 06:33:52 just over 3 minutes ahead of Tom who had been plagued by his sore foot throughout. 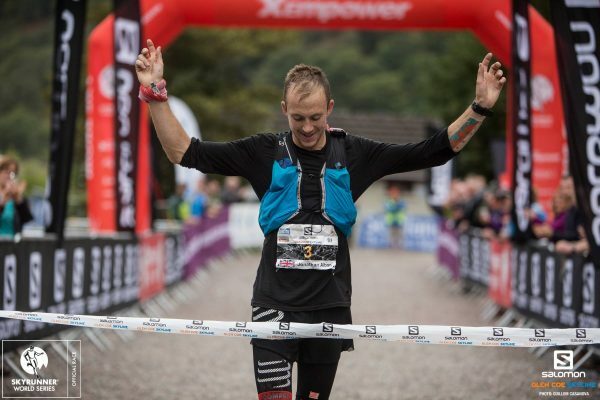 When asked what I thought of the race I could only be honest and say it was the best course I had ever experienced, it truly was a fantastic combination of everything a mountain race should be and trumped every race I have done to date. Tom and I now both had a victory and a second place in the series. Although with Glen Coe having bonus points I would take the series, it still feels like a draw to me, especially as Tom beat me at Kima, so if it was best of three, he would have the title. Still, we don’t make the rules, just play the game and at least for now the day and the series was mine. I now have a relentless period of championship obstacle races spread around the globe but couldn’t have started the final leg of my season in a better fashion.